There are people with their own blogs making this type of table and thinking they are saving money. Many of these plans, including the one above are completely the wrong way to build. I’m fairly new to “fine” woodworking and undertook a project of building a table from a Lowes Creative Ideas magazine. I have the table built and but the top has twisted so bad that the table rocked. So I trimmed the legs to level it after some reading online but the top has continued to twist. I installed table leveling feet before I could see how bad the top actually is. Does anyone have a suggestion as to how to fix this? I put 3 coats of poly on the top and 1 on the bottom of the wood slats. Every time I look at the table sitting in our kitchen I’m so disgusted and am wishing we would have just bought one, but we’ve spent the money and the finish of the table is nice – it’s just so twisted and visible. Any help is appreciated. I’ve written here before about using construction lumber for a project, but I’m just a little blog and the message hasn’t got through, so I’m trying again. There is a way to make things, and a way to make things that will last. Depending on the season and climate, wood can and does change size. Wood in a dry environment shrinks and in a humid environment expands. This change takes place widthwise, not in the length of a piece of wood, and is due to the internal structure of wood. Wood pieces that are placed side by side against each other and attached to something, or pieces that are trapped in a frame, will crack or warp. Table tops made of solid wood cannot simply be screwed down. Also please note that construction lumber is not made for furniture. 2 x 10s, 2 x 8x, 4 x 4s and 2 x 4s are not kiln dried to the water content that wood for furniture is. Have you ever sat a 2 x 4 in your house for a few days? It usually will end up looking like a hockey stick. Construction lumber is not sold to be used for furniture. If you use some of these incorrect plans your table, bed or chair might look good at the start, but will not last. Unfortunately there are people offering plans that are not properly designed. You may end up with something cheap, but you will most certainly be disappointed and get what you paid for. I am willing and happy to answer any and all questions about woodworking. Wise advice. Thanks for posting it. This is really good to know. I have seen a lot of those plans and have thought about making them before. Now, I will have to do some more research. Thanks for saving me some time, money, and frustration. Thanks for taking the time to post this Julie… I have often wondered what the long term condition of those builds would look like. I agree with your statement that the proper wood needs to be used. Furniture quality wood (cut with-grain/cross-grain depending on purpose and properly dried) is important. I was told not to totally poly a piece (inside drawers or under tables) to assist wood and avoid warp. Don't give up doing it yourself! The personal satisfaction (and getting EXACTLY) what you want is great! Also, painted pieces are excellent made with MDF. Great Post! Love it, though I did make a table with regular lumber and my husband just shook his head at me saying EXACTLY the same thing you did here. He does some woodworking. We did not screw down the top, just made an apron it sits in. I knew we would be using it outside for a patio table eventually so the twisting of the top was not a problem for me, but twist it did! I wanted the practice before moving on. Anyways, it takes bravery to go against the more popular opinion (aka blog). I am appalled at people using pallet wood in their homes and most of all to build childrens furniture. I worked in shipping in the past and was in charge of certifying pallets and let me tell you they are FULL of pesticides, fumigants and other chemicals. Even the heat treated ones. No one knows, when they pick them up from the side of the road or behind stores, what in the world has leaked, splashed or some how come in contact with them. Those chemicals out gas into your home and can be a huge danger. But I got flack for daring to mention that, people stubbornly wanted what they called Free wood. They have to be outside for years and years for all that to leach out with rain and the sun helping neutralize those toxins. And if people only knew that kiln dried lumber is not that much more than builder grade. Oh well, people shall live and learn such as the poor lady who wishes she had bought a table rather than wasting her money following instructions that are just plain misleading as to the quality of the finished product. Hi – I'm following, since I think I can learn a lot from you. I want to make nice things, or rework them, but am scared of power saws! I know my fear is partially due to the fact that I know almost nothing about woodworking. Glad I found you! Hey Julie, always great advice! Do you have a step by step tutorial you could link this to perhaps so a beginner could actually see how it's done? It's hard to visualize all the steps needed for a beginner. I'm so glad I found your blog! Off to read. Thanks so much for sharing this helpful info at the Open House party. Good to know! Though I would've asked my dad before constructing anything like this, he's a very good carpenter (build our house and almost everything in it including kitchen cabinetry). It's sad that a hardware store like Lowes would make a tutorial like this just to screw people over; that's not right, they're suppose to help with this kind of stuff, not hinder! New follower too, I love woodworking! I appreciate the tip. I have been making plans from anawhite.com and personally love her site and think she does a great job. I have been researching the information you have presented and it is great to know. So I do have a few questions concerning attaching the table top. Obviously it is not best with pocket hole screws as it does not allow for wood movement. How do you notch out the wood (the link called it a kerf cut) to put in place the mounting clamps you suggest? Is there an easy way to do it for someone who doesn't have a table saw? Also I have noticed other methods that still allow for the wood to move, is your method the easiest? Then as far as wood movement goes is attaching table tops one of the biggest issues? Do you not agree with attaching wood together with pocket holes at all? I am just curious. I would like to continue working with wood and building, but I do want my projects to last and I do want to continue using pocket holes where they are useful and ok. Hope that makes since. Thanks again! I will post a reply to this question and hopefully give some more information that will help others in my next blog post. I'll try to get it ready for tomorrow! Great advice Julie. I have seen those plans too. I'm still a complete novice when it comes to building furniture and probably would have done it just like it said. Great post Julie-although I am a rebel. I made a top for my kitchen island out of 2×6's, joining them with the Kreg Jig pocket holes. The way I read your post, you would not do it that way. How long would you say it will last? I'm not sure how gluing and clamping is much different than the pocket holes, so I look forward to your post about that. I think that many people these days are living on a very tight budget and they are not building "heirloom" furniture. It seems that they are fine if it only lasts a few years. Bang for your buck sort of thing. your first follower, and a huge fan! ps I totally agree with the comment above about the pallet wood. I would love to use it, but I too am afraid of the pesticides. I'm wondering why they treat them with all those products? Wow wonderful information! Now I need to find that follow up post! Was planning on making a table but now after reading your post I'm afraid of doing the wrong thing. Do you have instructions on doing it the correct way??? I do explain it above, but I'll summarize here. Firstly you do not use construction lumber, secondly you glue the pieces side by side so you have one solid piece for the top. Then you use the clips as I suggest. You really know your stuff, thanks for sharing with the rest of us! As DIYers, we are always using things in unexpected ways and sometimes may not use the right products! As for pallet wood, I can't bring myself to use it either…I'm always afraid of what it's been exposed to! I've been wondering why everyone is so hot to use construction lumber for tabletops and now floors! Can you imagine the gaps those floors are going to have after a couple of months? Wow… Thanks for your great tips! I'm gonna play devil's advocate here: There are exceptions to using pocket holes in the apron. If you elongate the hole after you've drilled the pocket hole, it will allow for wood movement. Also, buying the 2xx DF and SPF from big box stores can be used if you're patient enough to sticker it and let the moisture content drop. The problem is that most people don't follow the correct rules for using this type of lumber. Many seasoned woodworkers will use construction grade lumber in only after taking the steps to ensure it's fully dry. Okay "j". Who elongates the holes for pocket holes? Does "Kreg" include that infomation in the directions that come with their products? I have never heard of people using pocket holes saying that they elongate the hole. Additionally, how long are you going to sit the lumber to let the moisture content drop? And… if you do that, many people who are using this construction lumber, (that will end up crooked after it dries) do not have a jointer and planer to fix it. There is a lot of misinformation out there and because of it people think they can just go to the lumber store and make a table the same day. There are plenty of reputable sources that give specific instructions (with pictures) on how to elongate pocket holes. 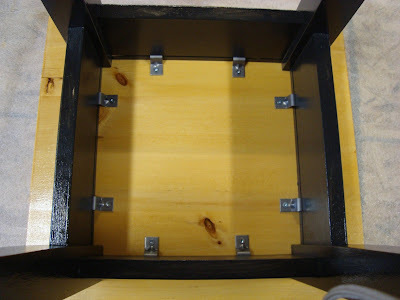 Finewoodworking.com is one source that gives a few examples of attaching table tops – using clips or pocket holes. Here is the link: http://www.finewoodworking.com/media/TabletopsFlat.pdf Regarding moisture, obviously location matters, but I live in Arizona and only sticker and store my wood for a month since it is desert dry with very low humidity. For those with OCD, then you can buy a moisture content meter and shoot for <10%. By the way, you can paint the end grain to prevent checking and minimize cracks. I purchase green and kiln dried 4×4 and 2xx Douglas Fir. I don't own a jointer or a planer and use hand planes. There isn't much movement on KD wood, and I can use about 80% of the green lumber (not bad considering the cost). I agree, there is a lot of misinformation but I also think big box lumber has its place and can be used in certain situations. Lastly, Kreg does mention the information in their manual under FAQ and to adjust the depth collar for a deeper pilot hole and then back off the screw a quarter turn to allow wood movement. It's the same thing as an elongated hole. I completely agree that there are sites with great information. I've been a subscriber to Fine woodworking Magazine for over 10 years and it is an excellent source. However most of my readers are from decorating blogs and they don't see that source, they see people taking 2x4s and screwing them together without any mention of stickering wood nor elongating holes. I am skeptical you can "back off the screw a quarter turn" and beat the effects of wood movement in a place with fluctuating humidity. Not all of us are fortunate enough to live in Arizona, where I suspect there is not much change from one season to another. Thank your for your wishes but I live in Canada and we celebrate Thanksgiving in early October, so the turkey is long gone. I hope you and your family have a Happy Thanksgiving. I want to build wood furniture. What wood would you recommend? I use pine if I want to stain the wood, as I prefer the look of the knots throughout. I never use construction lumber for this type of furniture as it is not dried to the proper amount for indoor use. Poplar is also a good wood because it is easy to paint, it also must be kiln dried for furniture. Ha! I did exactly what you said not to do in this blog. Now the tabel is cracking, I used wood filler to do ti, argh. So you think by jointing, gluing, clamping, and THEN mounting the top things will be ok, I want to make a table that is smooth as glass on top w/no cracks. Is that the best way to ensure it does not crack? And what would you recommend using as far as wood for a kitchen table top? Where to get it in America? Thanks! So where can one purchase kiln dried furniture grade wood if the don't sell it at big box stores? Or do they? And if so, how can one tell? Usually they don't sell it at big box stores. You need a supplier such as a lumberyard or mill. I buy mine rough and then I plane it myself. There are most likely local woodworkers in your area that can help you find a supplier. If you don't have the capability of planing yourself from rough, maybe someone local can do that for you as well. This is not just about "fine woodworking," it's about making furniture for your home that you put time into and want to feel proud about. Pine in construction lumber may very well be the same wood species that furniture is made from with one major difference. Construction lumber is not kiln dried to the same level, it is around 15% MC, while furniture grade is 6-8%. Most often the lumber at a big box store that you refer to is NOT at a useable level for furniture. If you read my blog post and look at the diagram, I show that edge glueing doesn't stop expansion. I say that it WILL change and that is why I use the Z- shaped clamps that fit in the rabbets. I show them in my last photo. You do admit they are correct and you have added a link to the exact fasteners that I use. I have seen a table top made with unglued construction lumber that was nailed down and each piece was tight to the one beside it. It did not take long for you to be able to fit a quarter through the slats. I'm not sure about you, but I don't want gaps in my kitchen table. So, are you going to tell us about using pocket holes to join the pieces together to make the top? How is gluing any better? I don't use pocket holes for anything. You can find many examples of how to use them online. Basically you are screwing the wood pieces together along the edges. If you use glue you get a solid joint the whole length of the board. I thought you were going to post information on your thoughts about using pocket holes to join the edges of the boards? Is it a good idea or bad? Can't you use glue and pocket holes to hold the edges of the board and then attach to top to the bottom using the method you posted above? while i agree wood moves, i have have seen and fixed the aftermath of people not putting a table top together properly (i have made countless numbers of table tops, countertops, beches, etc.) i will say this. Two years ago i had a large amount of people coming to thanksgiving, way more then my small table for four could handle. because i had the room i decided rather then go buy a table, i would slap one together quick with lumber i had and just use it for the occasion. i used 2×6 and 4×4. ripped a few of the 6's down to 4 inches for the aprons, and then put the rest together with glue and pocket hole screws, i use the kreg variaty. the table looked great, i glued the top and used kreg screws (again, i only planned on it being a nice piece for one day then relegate it to a glorified work table in my garage), i pocket holed the legs to the apron and the top to the base. i stained it dark walnut then waxed it. Three years later and the table still sits in my dining room, as sturday as the day i made it, no warping, no wiggle, no squeaks. all for about 60 dollars worth of material. so, if you are on a budget, and you have nice dry wood, then whip up the table how ever you want, because in the grand scheme of things, you can't beat a $60 table that looks rustic and beautiful, even if it dosn't hold up for more then a few years. I'd be interested to hear where you live (which State or Province), because that makes a big difference. But either two years (or three, because you say it's two years ago and then three) is not long. I think most people making their own table want it to last at least 7-10 years. Dear Julie: I am very curious as to your level of experience ?? Who do you use for your information ?? I have been building furniture out of construction grade wood for over 30 years and using a kreg jig to do so for as long as I remember… I really think your blog and your information is way off base, One of the most important things I haven't seen mentioned is properly picking out your lumber, this goes a long way in determining the results of your final project. If a chosen board is cupped, bowed,or warped in the beginning of your project it will certainly manifest itself in your finished project. Mark, I graduated as a Cabinetmaker (with the top marks in my class) in 2002 and have been making things ever since. I would ask you to please read my responses above to the same questions you have asked. My guess is that you live in a climate that has constant humidity year round and that you have not been educated about wood movement. There is a lot of information online about it, most by experts who can explain it much better than I could. My blog and information is not "way off base," rather it is in line with professional woodworkers around the world. Hi Heidi, can you give me some idea of what you are thinking of? Would it be wood legs that come directly from the slab, or would there be an apron? If you aren't sure maybe getting an idea on Pinterest or a Google search and then go from there as to how to construct it. How deep does the kerf need to be for these clamps? The kerf is about 1/4" to 5/16" deep. The slab is about 18" wide and about 3-4' long and 2"thick with no curtain. It's curvaceous. It used to have legs 2" diameter spindle type legs from the same wood, that were attached flush to the surface underneath with toe nailed screws that did not hold up. The legs are gone now. So I'd need new legs, probably something similar out of wood, (unless you have a better suggestion) and a sturdy way to attach them. I've tried finding ideas on Pinterest but haven't found anything. Metal hairpin legs don't seem like they would be very atractive. I'm also concerned with "cutting into the slab" for strengthening, or drilling a bunch of holes which I think would degrade the piece. Anyhow, I'm hoping for any suggestions that would help. Thanks ahead of time. I can agree that it's not a great idea. But most of the people building or buying these tables ARE looking for that old antique look. So any bows, or cracks in the table top (though rarely happen) are usually welcomed. Because it looks "rustic"
That's okay if you want it to look old, but having crumbs get stuck between cracks in a table top isn't the nicest, nor is a large crack in the apron. I've seen both, they are not so rare. Would you be so kind to let me know what type of wood boards or width wood (something like 1x12x8)can I use for flooring? I live in Omaha NE so humidity is normal here. Thanks so much in advance! I was very lucky to find this post and after reading everything here plus comments, I'm a little afraid to do any mistakes on the floor we want for our home. If you notice any older homes with real hardwood floors will have narrow strips. The narrower the piece, the less change in width, a 12" wide will really not be very good for staying the same size over time with humidity changes. Also, wood for floors should be tongue and groove, that gives the wood a place to expand and contract, in the grooves. I would go to a local flooring store and ask them what they would recommend. I live in a 100 year old house with maple tongue and groove floors and they certainly open and close with the different seasons. what are your thoughts, furniture made with construction lumber that doesn't have any non moving fasteners (Eg. Screws & Nails) built with joinery. Yay or Nay? Hi David. The joinery you show is beautiful, and mortise and tenons done correctly are great and I would suggest if you are going to take time to do that, it would be worth it to get the properly dried wood. But… if that is not an option, you have to take into account all the directions of wood expansion and contraction in your table design. So as long as you don't have opposing grain attached firmly together you should be okay. For example many people use screws and attach a table top so that if you look at the end, there is vertical grain from the top, attached to horizontal grain on the aprons. This is where the problems occur. Glue the boards together?!?! Absolutely not! If you think that gluing boards together is going to hold up when it's moved into a house from say a garage you are dead wrong. The glue will dry out and your boards will separate within a month. I've made hundreds of tables for clients and have never had a problem with attaching boards with pocket holes. DO NOT USE JUST GLUE!! I COMPLETELY DISAGREE. And I am not dead wrong. If you don't believe me, read Fine Woodworking magazine, or some other respected publication. I have used glue only for many years and never had anything separate. Maybe if you use glue with wood that isn't properly dried for indoor furniture… but then that is what this post is about, using the correct wood. Hi. I just started building furniture January, 2013, so I'm still learning. When I saw your post I was very interested to learn more. However, one of my first major build was a farmhouse kitchen table made from 2×8 construction wood. It held up good over the few years I had it. The only reason I got rid of it I'm changing the look of my kitchen. The table top was made from 2×8 and the legs from 2×4. I had no problem with it twisting. But I used glue and several "nail plates" to hold the table top. At that time I didn't have a pocket hole jig to join the wood together. Since then I have used the Kreg jig to join table tops. To be honest, I prefer the first way better with glue and the plates. My table held up to daily use and little busy girls doing their thang – lol. I don't know how long it's suppose to take for the wood to twist. But during my time, it never did. Maybe because I didn't use pocket holes. I would still use construction lumber again. But because of your article I would not use pocket holes on them. Frankly, I just build a table top using good, hard wood with pocket holes and regret it. Every time I've used pocket holes to join wood together they are never even. And because I had the same problem with my most recent table I told myself I need to learn another joinery other than pocket holes. I'm not totally against using pocket holes, but from my experience, I don't think it the best thing to join wood together. And for my personal peace of mind, I don't feel comfortable using just glue to join wood either. Thanks for the article. I'm not sure why your comments was removed because I did receive it in my inbox. Thanks for the link. Some people don't realize that construction wood is different than furniture wood and some will argue with me that I don't know what I'm talking about (see some of the above comments). If you read any serious woodworking you will know that wood movement is very important to take into account and I'm sure YOU get this! I am making a children's table (for toddlers) and am using 3/4" maple plywood. The base is a centralized, interlocking X (similar to knockdown style) and the top is a solid piece of plywood as well. Can I just use pocket holes to attach the solid plywood base to the solid plywood top? There is no apron as the base is centralized rather than a 4 leg frame. Thanks in advance for the feedback. You can always use pocket holes in plywood to plywood connections. I prefer screws straight in, if possible for your design, so not an angled pocket hole. Perpendicular screws get a better grip. Thank you for posting this article. It always defies belief when people try to shoot you down for suggesting the correct way to complete a job, rather than the fastest and vastly easier path, as has happened in the comments. I just made a table with buttons, and not only does it look much better for prying eyes, I'm satisfied in the knowledge that the top can expand and contract as needed throughout its life. Keep up the good work and thumbs up to you for doing things the right way. I guarantee the naysayers don't get a warm and fuzzy feeling when they look at their pocket holes. Thanks, Jarrad, for taking the time to write this. I am convinced that taking wood movement into consideration is the best path to take. I'm sure your table will be treasured for many years to come! I'm planning on building a large dining table to use on a screen porch in Texas. I was planning on using 1×6" kiln dried pine for the top (attaching to the apron with your recommended z clamps). I have a biscuit joiner and thought I'd try it to join the boards of the top. Would that help? Can I prestain the edges so that if it does separate a bit you don't have raw wood lines? Or would the glue not stick? Some people do use biscuits to join the wood boards, as it helps align them. If you are using yellow wood glue and clamps (and biscuits if desired) then your boards will not separate along the glue lines if you are using those clips. If you don't use the clips and just screw down the top, the wood will split somewhere where it experiences the stress of expanding or contacting. In most cases wood glue is actually stronger than wood fibres, so the split is not along the glue line. Now, that also assumes your wood edges are straight and level so that when you glue them there are no gaps. I've tried the popular method of glueing and screwing 2x8s together and had them warp badly within hours. can you recommend a better way to build a tabletop? Donald, construction lumber is not dried the proper amount to be used as furniture inside a house. I suspect that is what you used. You need wood that is properly dried to about 10 % moisture content, depending on where you live. Trying to understand…so gluing the pieces side by side is different than PH Screwing them side by side with or w/o glue? Gluing is stronger than pocket holes and much nicer looking. However, it’s much more important how a top is attached to the base. I completely agree with you on the need for using Z-clamps so that your glued up table top actually has the ability to move. I have a question pertaining to metal bases. I built an oak 1-3/4" thick table top glued up and biscuit jointed. For the same reasons you use Z-clamps for a wood table top and wood apron/leg setup, I'm worried that if I screw these metal base/legs to the wood top, the table top won't be able to move. The base is similar to the link below. I'm thinking about putting rubber washers inbetween the metal and wood and not screw it down as tight as I can. What you need to do is use elongated holes, perpendicular to the wood grain. This allows the wood to move while the screw is in. Don’t tighten the screw too much to allow it to pivot. Sorry for the delayed response, I have had trouble replying here. Those plans are fine… the basic frame is UNTIL he just puts the planks on top. Those planks will move and most likely crack where they are attached to the frame. I completely agree with you on the need to use Z-clamps on a table top you glued up like the pictures in your article are made. I made an oak 1-3/4" thick table top that I'm going to be attaching to metal bases, similar to the one in the link below. For the same reasons you use Z-clamps with a wood apron/leg setup, I'm worried if I screw these metal leg assemblies to the table, the table won't be able to move. Any experience or input on this? Hi! I am making a sewing work station for a cousin, using 3/4" Red Oak plywood for a 2' x 7' table top, to indeed avoid movement. The question is, can I then use construction grade 2×4 for the apron to stiffen the plywood, attached via brackets or pocket holes? Or should I worry about the apron getting funky on me? Thanks! Plywood is a good idea for that project but I would avoid construction grade 2x4s for the aprons. It may twist and get “funky” as you say. Julie, I live in Arizona and I, too, love using pine and I'm just getting into building furniture. Thus far wood from Lowe's is serving me well (though I have to search long and hard for decent pieces). Should I NOT do that for furniture or is it dry enough here that you think I'll get away with it? So far so good, but I'm not interested in wasting a lot of time and money on disappointment and frustration. Your wood needs to be dried to 8-10%, which your store should be able to confirm. Additionally your house needs to maintain a fairly constant relative humidity, usually controlled by a HVAC system. Wish I had found this post a few weeks ago. The same exact thing happened to my kitchen island. Had the base really solid but when I screwed the table top down it twisted it. Now I’m having to scramble to do all sorts of things to fix it and I’m wondering just how long the darn thing will last anyway? Wow! Six years of comments! Awesome! We built many, many tables over the last few years for clients out of construction grade lumber and not every one of them was a win. But most ended up being so. We would do a tongue and groove style of breadboard end that allowed for the top to expand and contract based on home and seasonal humidity. ( the top was a slab made from smaller boards laminated together with glue) The breadboards also helped keep the top relatively free from warping. Most table tops were then attached with 2-4 screws towards the center ends of the table. This wood is going to move like crazy and if you don't account for it, you are in trouble. Because of the nature of construction grade lumber it is a different beast than fine woodworking with furniture grade lumber. I spent years trying to merge the two, didn't work too well. HOWEVER, when using table top fasteners, only place them along the rails that are perpendicular to the grain direction, not on all 4 rails as in your picture above. Wood expands and contracts across the grain and not with the grain. 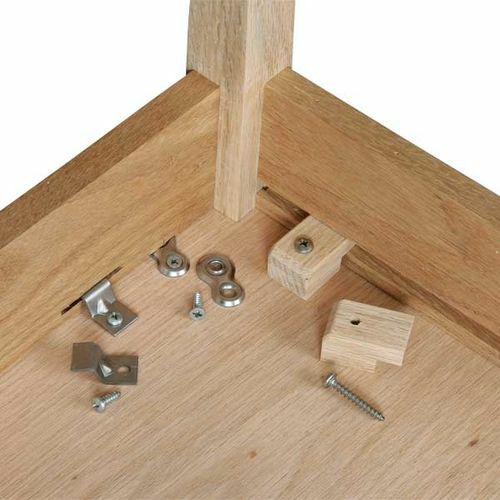 Therefore, placing table fasteners in top rails that are parallel to the grain will prevent that natural movement and defeat the purpose of using table top fasteners.